Droids deal 100% more damage with attacks not based on Health, but have a 15% chance to be destroyed when damaged by an attack. Droids defeated this way can’t be revived. Whenever a Droid is defeated, they deal damage to each enemy equal to 80% of that enemy’s Max Health and inflict Burning for 1 turn, which can’t be evaded or resisted. This damage can’t defeat enemies. Meanwhile, another post stated that Gear XII salvage will be farmable on Light Side and Dark Side Battles Stage 9 in the upcoming update and that both Rebel Officer Leia Organa and Imperial Probe Droid will return to 1 shard per Special Mission completed as opposed to the 2 shards we have been receiving for several months. So what does all of this mean? Well if you read the latest The (Probably) Road Ahead from Grand Admiral Sledge here at Gaming-fans.com, you can read what he says about more Clone Wars content, new Territory Battles maps and more. 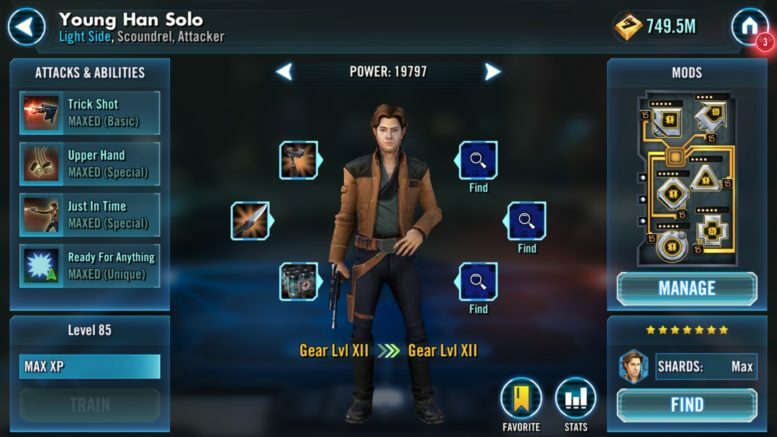 Be the first to comment on "SWGoH: Gear XII Salvage now farmable, April Territory Wars feature Han Solo & Droid bonuses"